This post will discuss how to use the results from steps 1 – 3 to prioritize the actions we have identified to close the gap or difference (delta) from where we are to what we aspire to be. 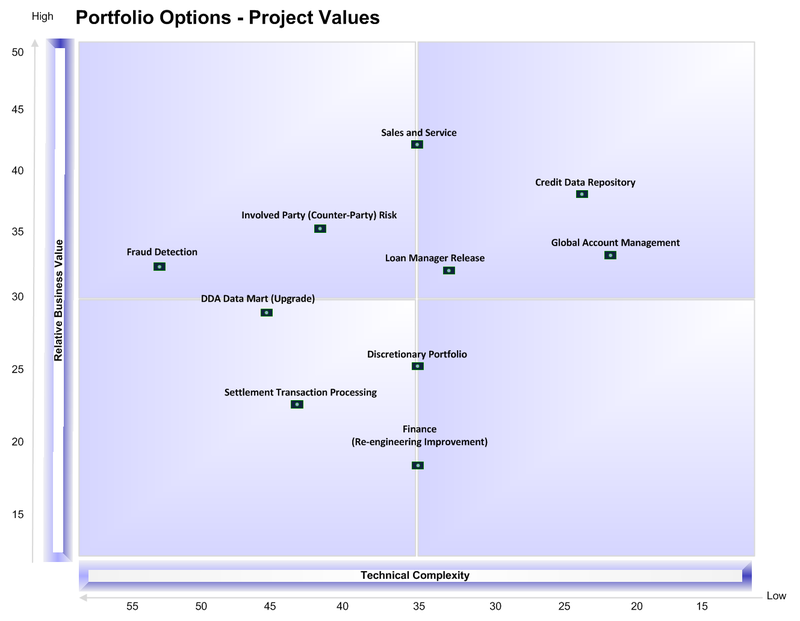 This is usually driven in a technology road map by evaluating the relative business value AND the technical complexity, plotting the results in a quadrant graph using an Action Priority Matrix. It is critical here that the stakeholders are engaged in the collection of the data points and they are keenly aware of what they are scoring. 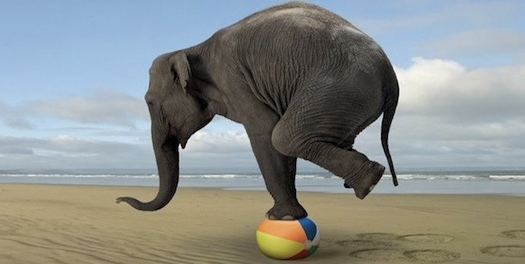 What we are doing here is IDENTIFYING what is feasible and what has the highest business value balancing business need with the capability to execute. We do this because the business will have goals and objectives that may not align with the individuals we collaborated with in our field work. We are making this process visible to all stakeholders to help discover what the tactical interpretation of the gap closure strategy really means. The tactical realization of the strategy (and objectives) is usually delegated (and rightly so) to the front line management. The real challenge is eliciting, compiling, and gaining agreement on what is important and urgent to each of the stakeholders. This is not an easy exercise and demands a true mastery of communication and facilitation skills many are not comfortable with or have exercised on a regular basis. A clear understanding of the complex interaction of any organization (and their un-intended consequences) is critical to completing this exercise. After the gaps analysis is completed further investigation should be performed by a professional with deep subject matter expertise and intimate knowledge of generally accepted best practices. In fact it is best to use prepared schedules in the early field work (if possible) to begin gathering and compiling the facts needed during the interview processes to mitigate “churn” and unnecessary rework. Using this schedule we will have captured our findings, suggested initiatives or projects, expected deliverables, level of effort, and relative priority of the gap identified. This level of effort and relative priority from this set of initial facilitated sessions is used to draft overall priorities that would drive planning for the initial and subsequent releases of the improvements as planned. At this point we have a “to-do” list of actionable activities or projects we can draft the working papers with for the prioritization review process using a variety of tools and techniques. I think the prioritization review is an absolutely essential step prior to defining the proposed program plans in the road map we are constructing. The review schedules facilitated sessions with key management, line managers, and other subject matter experts (SME) of the functional area in focus to identify the list of business processes representing all the major activities for which the functional area is responsible. In addition, we are asking this group of stakeholders to verify and confirm the business goals and objectives as value criteria and to score the relative importance of each gap identified. The following section describes some of the more useful techniques but is by no means an exhaustive survey of what is available. I’m going to focus on the Action Priority Matrix method in this post. I will discuss the other methods in a second part to this post in the coming weeks. The Action Priority method is a quick and simple technique used to determine where the value of the candidate projects (tasks) is plotted against the level of effort or technical feasibility to deliver. This provides easy to see visual cues to quickly spot the “quick wins” and the greatest rewards in the shortest possible time. I have focused on this ingenious approach for making highly efficient prioritization decisions because it works well to organize and simplify a lot of multifaceted options in one place. The Action Priority matrix is closely related to Grid analysis. This quick and simple diagramming technique plots the value of the candidate tasks against the level of effort or technical feasibility to deliver. By doing this we can quickly spot the “quick wins” giving you the greatest rewards in the shortest possible time, and avoid the “hard rocks” which soak up time for little eventual reward. We begin by asking the stakeholders to verify and confirm the business goals and objectives as value criteria (e.g., increase revenue share, increase brand image, etc.) and to score the relative importance of each gap identified. This is accomplished by multiplying a weight factor (based on a 100 point pool) by a 1 to 5 score (low or nonexistent support to very high support of business value criteria) for each process or gap identified. 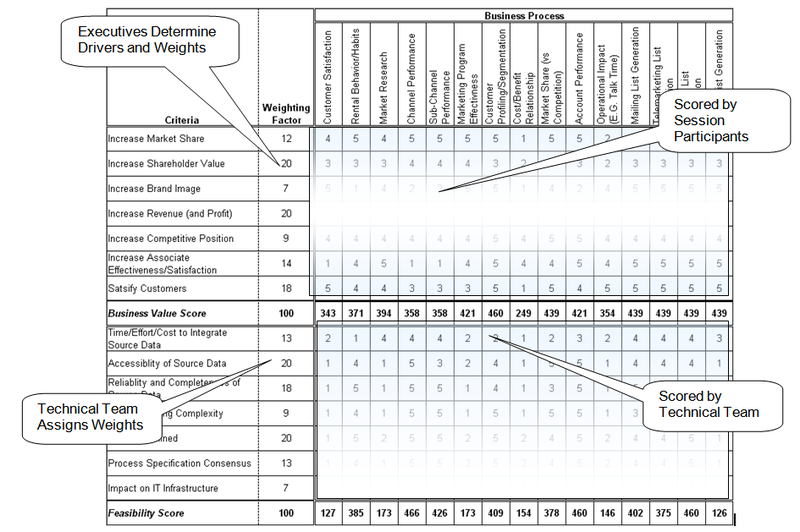 This business value score is combined with a technical feasibility score (based on a similar scoring method using criteria such as availability and reliability of source data) to define a data point on a risk matrix. The completed matrix map helps to clarify priorities where a high degree of feasibility exists in delivering the business need. The participants will reach consensus upon review of the scoring results and how associated data points align in the matrix. The goal of this review is to determine the relative importance of each candidate action that will be supported by the initial or subsequent road map decisions. The following diagram illustrates a simplified summary of what this technique looks like in practice. 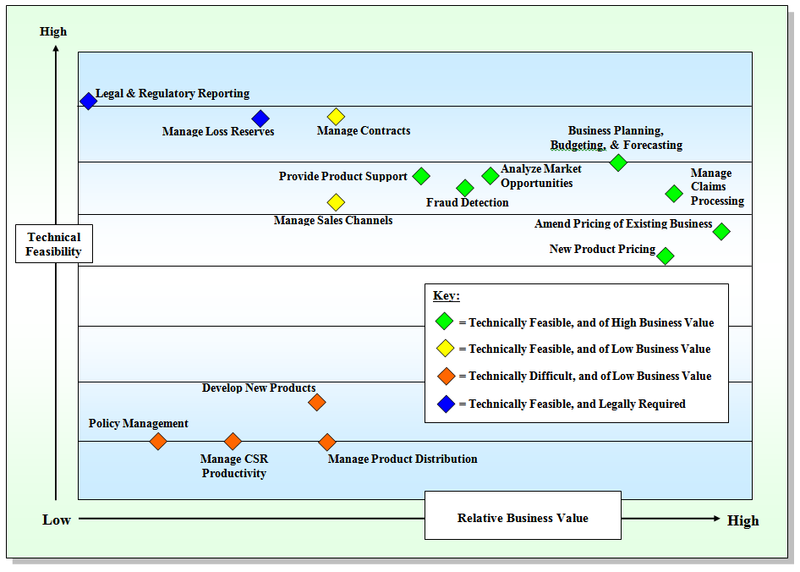 In this case we have summarized a set of business processes whose relative weight is scored by the business in the top quadrant. The technical team has scored each candidate set of processes in the lower quadrant independent of the business in terms of feasibility (level of effort estimated to complete). The results of this exercise are now compiled and summarized in the diagram below. We can now take this relatively “subjective” set of inputs and prepare a simple quadrant graph where technical feasibility and business value represent the X and Y axis respectively. 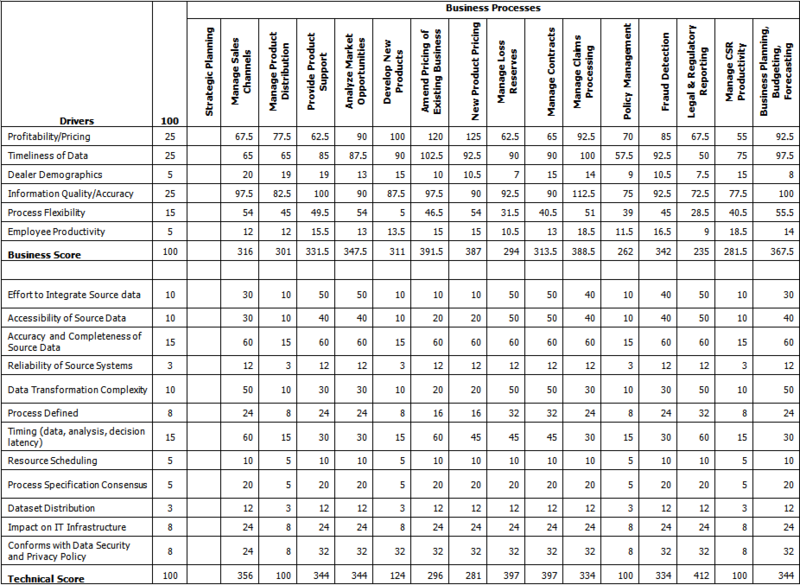 We have in effect quantified the relative priority of each candidate set of processes impacted subjected to technical feasibility constraints and displayed the results in a relatively easy to see visual representation of what is important (relative business value) and technically feasible. In short the method (as summarized here) has helped us prioritize where to focus our efforts and aligned business need with the technical capability to deliver. Here is another example where technical feasibility and business values are reversed or represented now by the Y and X axis respectively. This illustrates the versatility and flexibility with this method where it is more important to express the relative value of each option explored than worry about the absolute precision of the findings. Sometimes it is better to use the Nominal Group Technique before reviewing together as a group. This technique is a useful for prioritizing issues and projects within a group, giving everyone fair input into the prioritization process before reviewing the Action Matrix as a group. This is particularly useful where consensus is important and a robust group decision needs to be made. Using this tool, each group participant “nominates” his or her priority issues independently, and then ranks them on a scale, of say 1 to 10. The score for each issue is then added up, with issues then prioritized based on scores. The obvious fairness of this approach makes it particularly useful where prioritization is based on subjective criteria, and where people’s “buy in” to the prioritization decision is needed. This is especially useful because when a group meets the people who shout loudest, or those with higher status in the organization get their ideas heard more than others. So when it comes to gaining consensus on important decisions or priorities, how do you make sure you get true consensus and a fair decision for the group? The benefit of the technique is that the group shares and discusses all issues after independent evaluation, with each group member participating equally in evaluation. The evaluation works with each participant “nominating” his or her priority issues, and then ranking them on a scale of, say, 1 to 10. Discussing the results together mitigates the noise and distractions of those who do shout the loudest or dominate group dynamics. I think you can see there are a couple of techniques we can use to prioritize the findings from our gap analysis into a coherent, thoughtful set of ordered actions we can take. Will be discussing other methods and techniques you can use in the coming weeks. Many of the techniques discussed here can (and should be combined) to capture consensus on priority decisions. I focused on this first part on the Action Priority Matrix method due to its structure and group involvement for making highly effective and efficient prioritization decisions. This entry was posted in Enterprise Architecture, Methodology, Roadmap Development and tagged Enterprise Architecture, Roadmap development, Tools. Bookmark the permalink. ← What is Natural Language Processing? thanks for the article and sharing your knowledge. It’s something I find valuable. In the graph, it’s the contrary which is plotted.